"I like the disco music that's out now." 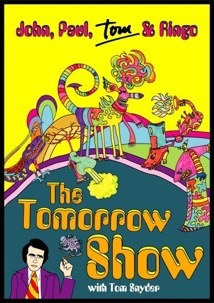 One of the more odd talk show hosts was Milwaukeean Tom Snyder, who had a long run with The Tomorrow Show in the late, late night. Over the years Snyder had some fascinating musical guests on, though Snyder, like Cavett before him, didn't seem to have a good grasp of just how important the performers appearing with him were. That wasn't necessarily a problem with the three former Beatles who appeared on his show, though his lack of knowledge about the subject of music is fairly obvious, and as a result many of his questions come of as irritatingly vapid. But the shows certainly include some interesting footage of the former Beatles that will make this essential viewing for their fans. Disc 1 features the tribute show to Lennon, aired the day after his assassination. The centerpiece of that program is the 1975 interview with Lennon, during the height of his issues with American immigration. John doesn't seem particularly enthused but gamely talks about Beatlemania and the dynamics of the group, and tries to make clear that the breakup of the band had more to do with getting bored rather than animosities. Lennon gets more interested when he starts to discuss his theories of musical development. His wit and sly humor come through in the talk about his infamous bed-in with Yoko Ono and the notorious Two Virgins album cover. Snyder shows himself to be the dense voice of Middle America when he can't help himself but to ask, "Why do you do those things?". The second half of the interview includes some frank talk about Lennon's drug usage, and his immigration attorney explains the legal situation rather deftly. Later segments of the 1980 tribute program include an interview with reporter Lisa Robinson, who befriended the Lennons and published the last interview with John, and Jack Douglas, who produced the Double Fantasy comeback album. The second disc includes two shorter programs, the first of which features Paul and Linda McCartney in 1979, via satellite from London. This is the only show that incorporates a full musical performance, the music video for the lesser Wings tune, Spin It On. There's a good deal of discussion about their family and life on a sheep farm in Scotland in between touring the world. It's a rather uncomfortable conversation, though Paul's cleverness and charm come through quite nicely, even as the conversation devolves into the economics of British wool gathering. Snyder oddly enough is at his best in discussing Linda's photography, though he gets himself in hot water by indirectly insulting her musical abilities. Several members of the band Wings join in the closing minutes to say hello. Paul has some amusing remarks about the Paul is Dead rumors. Ringo Starr appears in a November, 1981 episode of the program, promoting his new album. He also enjoys showing off his new bride, Barbara Bach after the obligatory discussion of the origins of his nickname and the abuse he took in Liverpool. Bach contributes an amusing discussion about the difference between Ringo Starr and Richie Starkey. The second half of the program is devoted to Angie Dickinson, who was promoting her new series, Cassie & Co., which ended up lasting only half a season. She more memorably discusses working with De Palma on Dressed to Kill, and in particular the filming of the taxicab sequence, which appeals to Snyder's prurient interests. Dickinson also offers some pleasantries about the Kennedy family though declining to dish any serious dirt. Snyder manages some decent lines of questioning every now and then, though he appears oddly rude to his guests frm time to time; that's most noticeable in the McCartney episode, in which he studiously ignores the McCartneys even though they're being linked into the studio and can be seen waving on the monitor as Snyder yammers on about something irrelevant. He's never at a loss for a question, no matter how insipid they might be. Interesting some of the shots use very tight closeups of the guests, which was probably a necessity on televisions of the day, but which make quite an impression on today's larger screens. It'd be nice for modern talk shows to use similar closeups so a better sense of the interviewee can be obtained (though I suppose HD clarity might not be welcome to all of those guests). Snyder can't help but talk about Beatles reunions with all of them, which seems rather pathetic from this vantage point. Nevertheless, one kind of wishes he could have interviewed George as well, so that the same perspective could be obtained for all four of them. Image Transfer Review: Considering the source material is videotape (second generation in the case of John Lennon), this is a pretty attractive set. Detail is reasonably good even though there's a certain amount of softness, allowing one to make out Lennon's five o'clock shadow. Black levels are very good throughout. Colors seem rather off and washed out on the McCartney episode. There are several video dropouts and odd freezes of the picture at times that some viewers may find distracting. Audio Transfer Review: The original English mono is reasonably clean, with only mild hiss and noise. Since there's not much in the way of actual musical performance present, that's quite acceptable for the material. Extras Review: Even though the questioning could have been improved on, these are still fascinating historical chats with three of the former Beatles. The transfer is quite acceptable considering the videotape sources. Even though the questioning could have been improved on, these are still fascinating historical chats with three of the former Beatles. The transfer is quite acceptable considering the videotape sources.